Who doesn’t love a good bracelet or cuff? 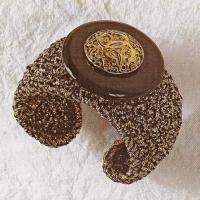 I am especially fond of cuff bracelets and certainly have my favorites. I know that if I get a lot of comments on the bracelet I’m wearing, I probably need to make it into a tutorial. So, that’s what you’re seeing here: the best of my wire bracelets. 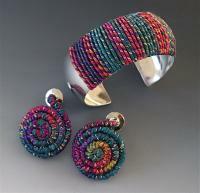 Bangles and jangles, wire and beads, woven and wrapped, there’s something here to suit anyone’s favorite bracelet type. As always with my designs and tutorials, you will not only learn a project but a new and unique wire jewelry making technique as well. I spend countless hours testing, twisting and tricking wire into as many new techniques as I can think of. All of that's to say that if you want to learn how to make bracelets with wire, you've come to a good place for some unusual wire bracelets. 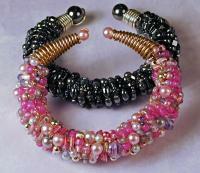 I do so hope you enjoy the results and enjoy learning how to make bracelets in wire. 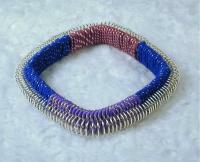 CB11- Colored Wire Bracelets is one of those "Wow" tutorials as evidenced by all of the emails from happy customers. CB03 - Round braiding with wire is an incredibly versatile and quick way to learn how to make wire bracelets. In this tutorial, you'll be learning how to easily manipulate and braid aluminum wire into complex looking braided bracelets. These bracelets use sterling silver to add strength and weight for very wearable wire jewelry. CB08 - "Lana" is a pretty lady wearing herself sparkly but delicately in pink or for sturdier days, in black. A simple technique, using a dowel to create slight hollowness, rounds out the look of these bracelets. CB02 - These textured bracelets draw lots of attention for their unique texture and coloration. The first bracelet uses several layers of different colored wires wound on top of a basic bracelet frame to create a very delicate, airy wrist adornment. It is lightweight but substantial and fascinates anyone who sees it. 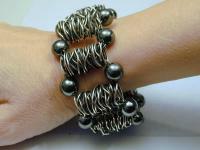 CB07 – Gun Metal Crochet Bracelet. Have you ever tried crocheting into chains? Remarkably fast and visually appealing, this bead crocheted chain bracelet is both a pleasure to wear and a striking piece of jewelry. Just double click on the photo to get a closer look.